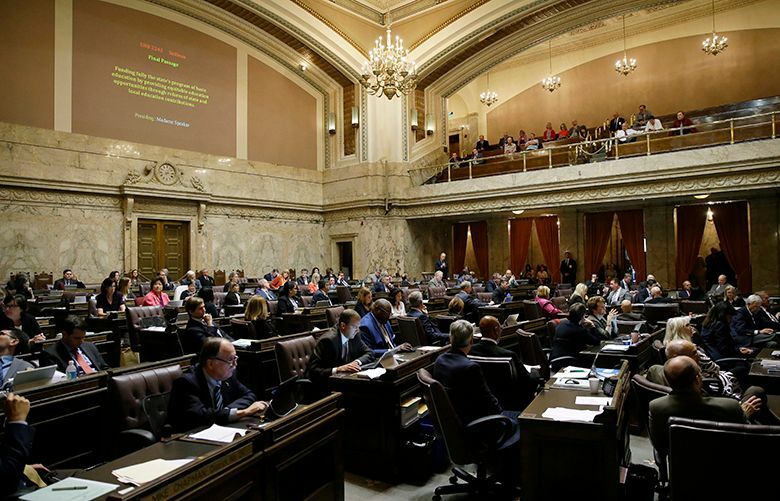 Education policy advocates celebrated the elimination of formulas that rewarded affluent school districts in Washington state. But reforms to that system may recreate the exact same disparities for high-poverty schools. Better pay for new teachers. Half a billion dollars for high-poverty schools. New accountability for school districts’ spending of local property-tax levies. They also cheered the Legislature’s decision to do away with “staff mix,” an obscure state formula that provides districts with more funding if they employ more experienced and highly educated teachers. Opponents have said that formula is one of the largest drivers of inequity in Washington schools, arguing that the staff mix system rewards money with money in affluent districts that already can afford to hire top teachers. But despite that victory, some school-finance and policy experts now worry that a new formula — one that funnels more money to districts based on local housing prices — might recreate the exact disparities they hoped to eliminate with the end of the staff mix formula. “This system will still send more money to districts that serve fewer students living in poverty,” said Zahava Stadler, policy and research manager with EdBuild, a nonprofit focused on school-funding issues. She noted the state Supreme Court, in its landmark McCleary ruling, ordered lawmakers to end a reliance on local property taxes as a way to pay for public schools. State Sen. Andy Billig, D-Spokane, was one of eight lawmakers who spent months negotiating a final McCleary fix that Gov. Jay Inslee signed into law Thursday. Billig said the negotiating team considered about 50 ways to regionalize teacher and school-worker salaries so districts could afford to pay competitive wages locally. “It was the most difficult policy challenge of the plan,” he said. Billig acknowledged the new salary formulas will advantage schools in affluent areas like Mercer Island, the state’s priciest home market. But he also pointed out that less-well-off districts, such as Federal Way and Enumclaw, will get some boost to pay teachers more, just not at the same level as Mercer Island. “We closed the gap significantly in terms of funding for schools in high-income areas and schools in low-income areas,” Billig said. But it’s not entirely clear whether that’s true. An early analysis from EdBuild, which is in part funded by the Bill & Melinda Gates Foundation, suggests the new housing-based formula actually creates a more regressive funding system than staff mix currently does. The new formula, for example, results in no additional money for any district with a student poverty rate of 30 percent or above. Under staff mix, each of the state’s 295 districts got at least some extra funding to compensate for the average education and experience of their teaching staff. “This is a bad idea all around,” said Marguerite Roza, a Georgetown University professor and school-finance expert who lives in Seattle. No fan of staff mix, Roza described it as “incredibly odd” that the state would base school salaries on housing prices, especially since many educators don’t live in their district. “And Mercer Island has no trouble recruiting teachers, so why subsidize them?” she asked. The housing formula does include a 15-mile radius to calculate median residential values for each district. So in King County, all but the Federal Way and Enumclaw districts will receive the same 18 percent bump in their salary allocations from the state. Lawmakers want all paraeducators in Washington schools to complete formal training — but will they pay for it? And Billig argued that many of the districts that will receive lower amounts or no extra money at all since they have average or lower-than-average housing values don’t necessarily need to pay higher salaries to recruit and retain educators. “There’s no way you can say we need to pay the same in Mercer Island that we pay in Wapato,” Billig said. Lori Taylor, a professor at Texas A&M University, has studied how a dozen other states have tried to adjust school salaries to account for regional differences in the labor market. She questioned the wisdom behind the Legislature’s decision to base its adjustment on housing prices, and she noted a well-performing district will be attractive to residents, who create a bidding war for housing in that community. “That will lead to an increase in housing values and then an increase in revenue from the state,” Taylor said. “It can become a virtuous cycle in the sense that the local school district will be rewarded for making itself more attractive to residents … but the spiral can run in the other direction. “If I have a low-performing district, and people don’t want to live there, and they move out, the housing values collapse and then I’m going to get even less money” to help the remaining students, she said. The new formulas don’t kick in until the 2018-19 school year, which could offer the Legislature a chance to make changes when it convenes for a supplemental session next year. And to lawmakers’ credit, Stadler, of EdBuild, applauded their approval of a new $500 million fund that will help schools with a high concentration of students living in poverty.